Machine washable (We suggest you wash inside out for a longer lasting print). Great for Christmas gifts, birthdays or just to treat yourself to a great graphic tee. 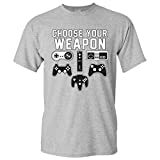 A high quality gaming shirt that will satisfy any gamer in your life, regardless if they like Retro or Triple A titles.